Yes I do, I am in need of a challenge. When Kylie mentioned on twitter that there was a kids sew-along happening with the Elsie Marley blog, I had to know more. So I have signed up to the Kids Clothes Week Challenge. It runs for a week starting today. 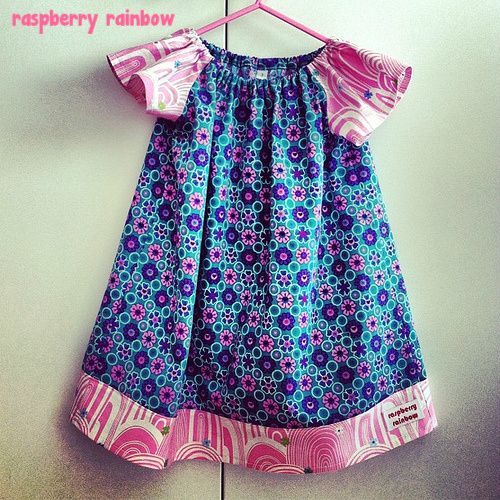 The challenge is to spend one hour a day (or more) making clothes for your kids. For the last three days, I have actually already been doing this, so I plan to continue for another week and see what I can achieve. This is one of two dresses I have made for Zoe, over the last 3 days. I also designed/made the pattern, I'll talk about that in another post. I am very happy with it! So I dare you all, if you have children in your life, sign up here. Have a happy week creating for the children in your life. PS: Cam, I promise, I will finish my Lisette dress this week, for your sew-along. Yes, I am a naughty girl starting a new one before finishing yours. Now that, is a gorgeous little dress! You are so clever Cat, always love your creations. I am actually dabbling in a bit of (hand) sewing children's clothes at the moment, nothing spectacular, but really enjoying it. If I get better, I will join in with challenges like this one in the future.